A project sponsored by the Austrian Federal Ministry for Transport, Innovation and Technology (bmvit), managed by the Austrian Science Fund (FWF), Research Line "Translational Research"
The goal of this project is to develop technologies for the automatic segmentation and interpretation of audio files and audio streams deriving from different media worlds: music repositories, (Web and terrestrial) radio streams, TV broadcasts, etc. A specific focus is on streams in which music plays an important role. the automatic characterisation of audio segments and sound objects in terms of concepts intuitively understandable to humans. To this end, we plan to develop and/or improve and optimise computational methods that analyse audio streams, identify specific kinds of audio content (e.g., music, singing, speech, applause, commercials, ...), detect boundaries and transitions between songs, and classify musical and other segments into appropriate categories; that combine information from various sources (the audio signal itself, databases, the Internet) in order to refine the segmentation and gain meta-information; that automatically discover and optimise audio features that improve segmentation and classification; and that learn to derive comprehensible descriptions of audio contents from such audio features (via machine learning). The research is motivated by a large class of challenging applications in the media world that require efficient and robust audio segmentation and classification. Application scenarios include audio streaming services and Web stream analysis, automatic media monitoring, content- and descriptor-based search in large multimedia (audio) databases, and artistic applications. We learned spectro-temporal features for independently detecting the presence of speech and music in radio broadcasts. We developed a prototypical web-based tool to visualise and compare different annotations or segmentations by humans or our algorithms. 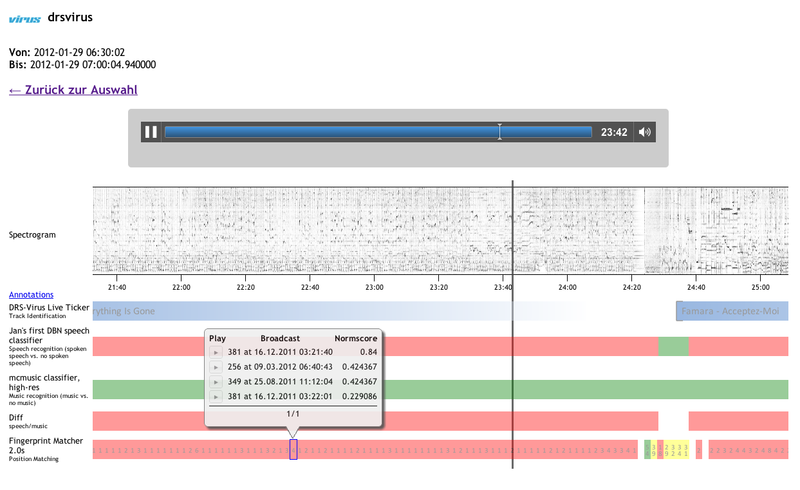 We developed and licensed a software component for segmenting radio broadcasts to the Danish company RadioAnalyzer. We gratefully acknowledge the support of NVIDIA Corporation with the donation of a Tesla K40 GPU used for this research.